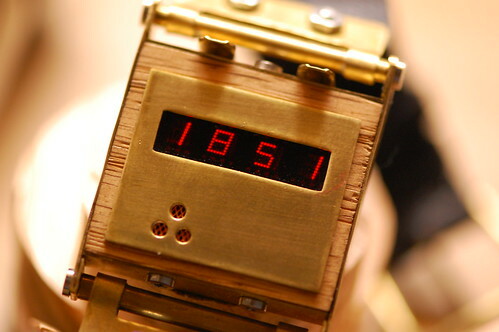 Yes, it’s an LED steampunk wristwatch! 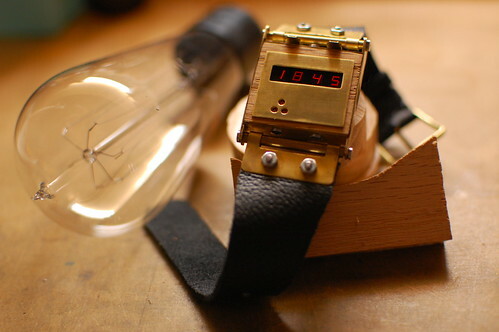 It uses the LED wristwatch board (see this previous post). The watch is constructed from a small piece of oak and pieces of brass sheet and tubing. I used hand tools, a Dremel tool and a cordless drill to shape and form each of the pieces. Nice watch. Can you post details about the construction of the case? How exactly are LEDs steam punk? If it was a flip display, that would be cool, but seriously. Stuff like this is why I hate steam punk. 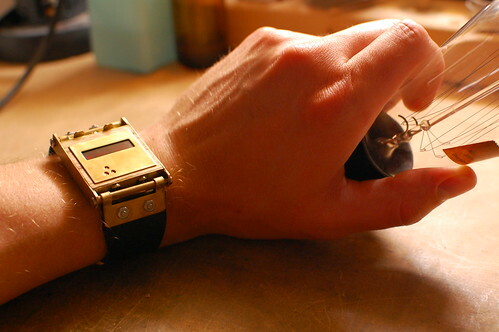 Fantastic watch, I don’t care if it isn’t ‘official’ Steampunk. By that definition I could jump all over some of the costuming for not being accurate! Get a kick from everyone in dispute about authentic or not. Its steam punk all made up make-believe and whatever you say is what you say. With that said it you made one as a pocket watch it would be more steam punk. A nice big brass pocket watch, YA that would be nice.